This robot journalist can explore its surroundings, take pictures, interview people, perform internet searches, and publish online. Ok, I'm about to lose my job. Robots are after my job. Researchers at the Intelligent Systems Informatics Lab (ISI) at Tokyo University have developed a journalist robot that can autonomously explore its environment and report what it finds. 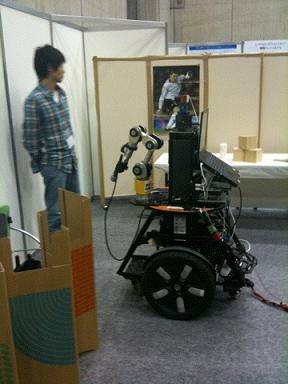 The robot detects changes in its surroundings, decides if they are relevant, and then takes pictures with its on board camera. It can query nearby people for information, and it uses internet searches to further round out its understanding. If something appears newsworthy, the robot will even write a short article and publish it to the web. Charlie Catlett, from Argonne National Labs, seemed impressed with the bot, and it made a splash at the most recent meeting of the Information Processing Society of Japan. 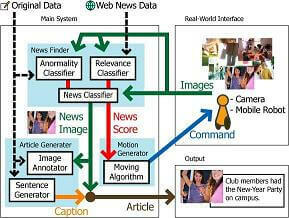 By combining real world and internet research, the journalist robot is taking a step beyond other automated systems. Give it enough time, and robots like these could become a valued asset for news feeds everywhere. We’ve seen a growing trend for automated journalism in the last year. There’s software that can write a decent sports story or even generate original news video by compiling images and opinions from the web. Journalist robots, however, are really taking the phenomenon to another level. This is the first robot I’ve seen that gathers primary source information from people in the field. That’s real journalism, even if it’s at a primitive level. What’s more, if our experiences with crowd-navigated robots have shown us anything it’s that people seem to like helping bots in need. Robot journalists can go to areas too dangerous for human reporters. Back in 2002, MIT created the Afghan eXplorer robot to cover the war there. Of course, that robot was a teleoperated shell while the ISI bot is autonomous. Which means that we can make a huge number of these bots, send them out into the field unsupervised, and have them generate a new era of robot written media. People may even want to read it. Of course, human journalists are likely to be preferred for years to come. After all, the robot can’t take pictures, do independent research, interview witnesses, work under extreme stress, pull an all-nighter make pithy pop culture references. 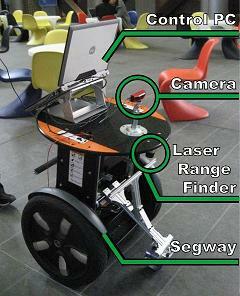 An older model of the journalist robot shows some of its components, including a base adapted from a Segway. The robot journalist compiles information from both live and online sources to generate its article.